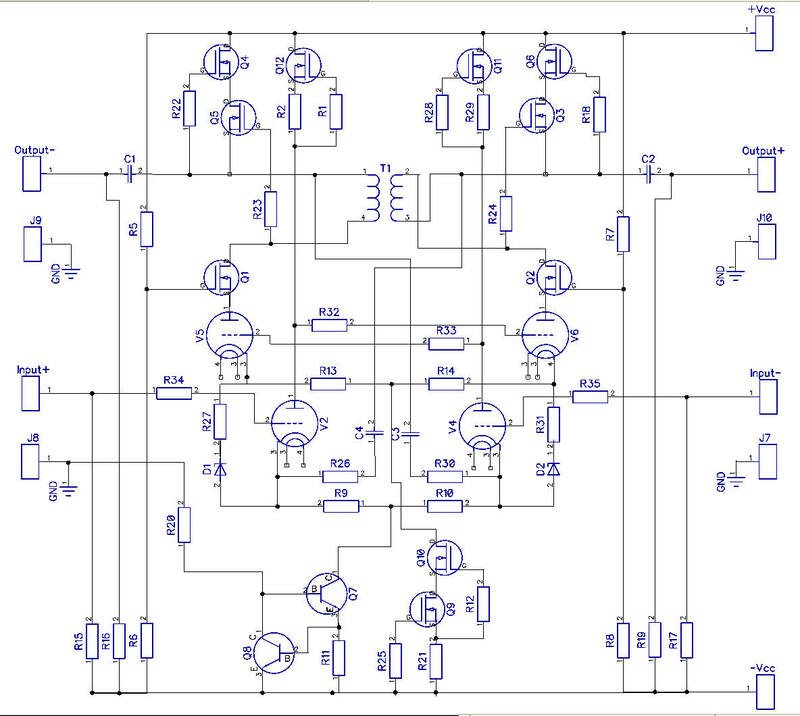 I suppose that I could introduce just one more “little” change in the concept relating to the Single Super Voltage Amplifier Stage. Some time ago I read an interesting article written by Mr. Alan Kimmel. He presented a variation of a mu-follower stage, but modified in such a manner, that instead of using a resistor as the “load” just beneath the cathode of the output tube, he sugessted to replace the resistor with a choke. Such a circuit presented better overall performance in comparison to the standard circuit. The circuit presented a more ‘even’ swing with less distortion, but also a higher voltage gain and higher possible peak-to-peak output signal. If we were to modify my last design concept in a similar fashion, we would in essence replace two resistors with two independent chokes … hmmm …. Wait a minute ! Do these chokes really need to be two independent devices ? Is it not that each branch of the LTP is in essence a mirrored, anti-phase representation of the other branch ? Indeed, we have an inverted signal flowing through the opposite branch. In this case, I have an intuitive feeling, that if we use a Differential Mode Choke, with two independent windings, but wound on a common core, additional benefits, possibly better linearity, may be achieved. Such a Differential Mode Choke would in essence constitute a line transformer, with a turn ratio of exactly 1:1. Below is a representation of how this could look like. It is likely, that we could find a nice line-stage 1:1 transformer, that would nicely fit in here, from the Lundahl offering. The way I see it, I get the impression that this is a case of a Constant Current Draw type of circuit. Partially, as a result of the constant current sinks in the cathodes, as well as constant current sources in the anodes. But also in AC terms, so it seems. When the tubes on the one side are in a state of maximum conduction, the tubes on the other side are conducting the least, and vice versa. 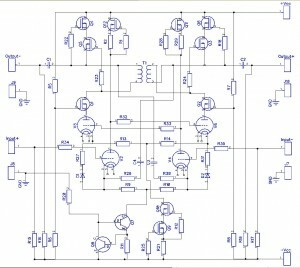 If all turns out right, the power supply feeding this circuit should in essence be providing it with a constant current. Looking at the sum of currents drawn by both of the branches, it should be a “Constant Current Draw”. I do hope that this topology, with it’s low output impedance and adequate voltage swing, will be capable of directly driving a pair of push-pull output tubes (be it OTL, or a traditional topology, like the Ultra-linear Push-Pull). 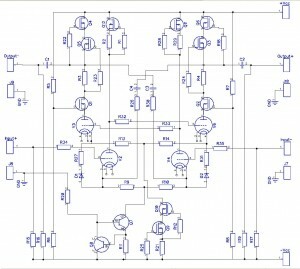 This circuit can be a good fit for any fully differential type of amplifier construction. 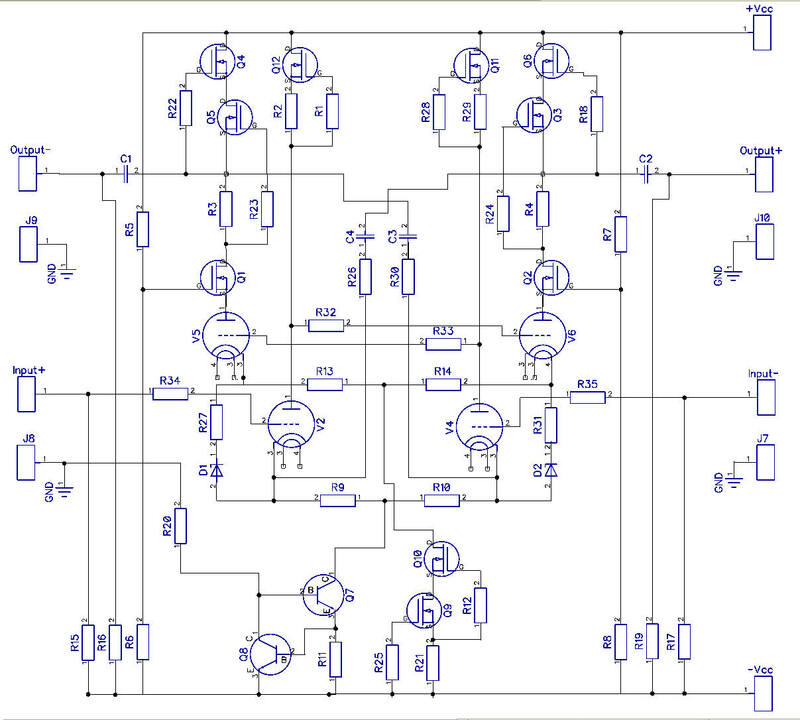 But this circuit can also be easily adapted for the context of a non-differential amplifier, and similarily can drive the output tubes as above. You may ask: but where is the phase inverter ? Well, we do not need one. It suffice that we ground the inverting input of the circuit, providing the signal only to the non-inverting input. This will result in a slightly weaker, albeit fully differential (i.e. both ‘phases’) signal, available on both of the outputs. If you wish to close a global negative feedback loop – you shall do so in a very traditional manner, taping in to the output signal from the output speaker terminal and feeding a fraction thereof, via a voltage divider, to the inverting input of the circuit above. if your output tubes like to operate off a voltage in the range of 400~450VDC, it would be possible to power both this input stage, as well as the output stage, from a single high voltage supply. It would be reasonable, though, to provide some additional filtering, via additional RC, so as to “separate” this input stage from load fluctuations of supply voltage, induced by the output stage. Your comments – via contact email or Facebook – kindly welcome.